hunt rats to sell for cash and to put on the table. The price of rat meat has quadrupled in Cambodia this year alone, driven by demand as more and more of the poor are unable to afford any other form of meat. Cambodia also sells rat meat across the border in Vietnam. 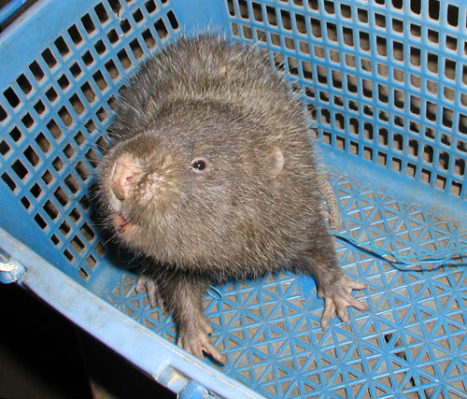 Cambodia sells an estimated tonne of live rats to Vietnam daily (some estimates are considerably higher). The inflation rate there was recently figured to be at 37%. 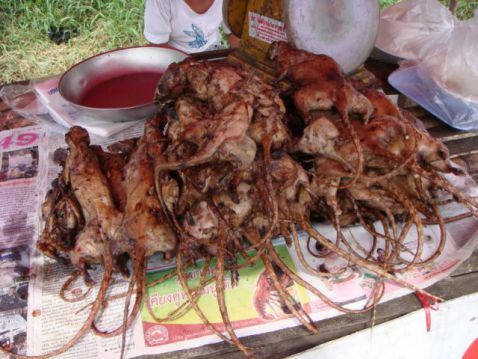 Spicy field rat with garlic has become a popular dish as the price of rat is 5,000 riels per kilogram in a market where beef is over 20,000 riels per kilogram. That means that one kilogram of rat meat is $.64 (up from $.16) per pound compared to $2.56 per pound for beef. Rats for Sale in the Market (Photo by Nicolai Bangsgaard/Creative Commons via Wikimedia)When the Mekong River Delta flooded, local villagers were able to catch the rats that were fleeing to higher ground. Families sell the rats to make money, but also hold some back to feed the family. Rats are also widely eaten in Thailand, and recently state governments in eastern India have begun to encourage people to eat rats to combat steeply rising food costs as well as grain stocks. Rat meat is illegal in much of the West, including the United States. Last May, U.S. Customs officials intercepted 19 pounds of antelope and rat meat from a passenger arriving in Newark, New Jersey from Uganda. The U.S. banned the import of rodents from Africa for any reason in 2003 after a human outbreak of monkeypox, an illness that had never been seen in the Western Hemisphere previously. The United Kingdom has recently been battling an upswing in the sale of rat and other illegal "bush meats." What Will Ikea Think Of Next? Dog Parking Lots!